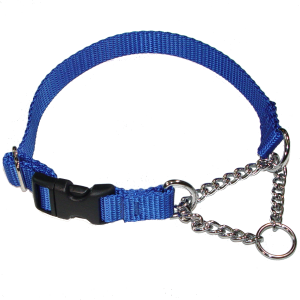 A Chain Martingale collar with a heavy-duty quick release snap to make it easy to get on and off your dog. Available in 3/8, 5/8, 3/4 and 1 inch widths in an assortment of sizes and colors. Sizing Information: The Martingale Quick-Snap Collar is sized differently than other collars. The measurement is taken at the top of the neck, directly behind the ears. This corresponds with the maximum size of the collar. Due to the number of sizes and colors available, your order will be manufactured to your specifications in the order it is received at our offices. Please Select...3/8" x 8-10" 3/8" x 10-12" 5/8" x 10-12" 5/8" x 12-18" 3/4" x 14-22" 1" x 14-22"